International law has become part of everyday family law practice, as lawyers everywhere are confronted with questions regarding the rights of 'mail-order' brides, the adoption of children from other countries, the abduction of children by foreign parents, and domestic violence victims seeking asylum. Indeed, globalization is transforming family law, even as families themselves are being redefined. 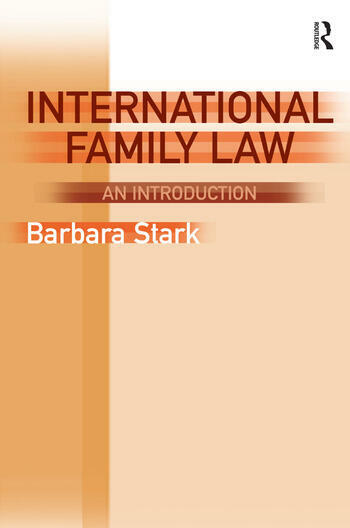 This book provides a practical overview of such issues and also examines the ways in which culture shapes family law in different countries. It provides students with a useful introduction to challenging, complicated and fascinating issues in international family law. Finally, by incorporating a comparative perspective, it gives readers an opportunity to re-examine their own legal systems. Contents: Introduction: why study international family law? ; Marriage; Partnerships other than marriage; Adoption; Divorce/marital status; Divorce/maintenance and support; Divorce/property distribution; Reproductive rights and abortion; Visitation; Child custody and abduction; Child support; Domestic violence; Human rights for the family and human rights of individuals within the family. Index. Barbara Stark is Professor of Law at the Hofstra University School of Law, USA.